Call to Schedule Septic Cleanout Service! We offer a wide range of septic services for residential and commercial customers in Gainesville and the surrounding areas! We are the best company in the area and can assist you with septic installations and septic cleaning services. In addition to these services, we also rent portable toilets for your convenience. All our services are affordably priced. If you want more information about our septic installations or wish to schedule your septic cleaning service, give us a call today. The solution to keeping your septic system working efficiently for a long time lies in regular septic cleanout. Rely on our experts for quality cleaning performed in a timely manner. We understand your busy schedule and ensure the work will be done on time. If you have any questions or concerns about our septic services, feel free to call us. For quality septic cleanout in Gainesville and the surrounding areas, contact our experts today. In addition to septic services, we also provide portable toilets for clients in Gainesville. Do you have an event coming up? Are you starting your construction project? If you are looking for portable toilet rentals, we have you covered. Our toilets are clean, well-maintained, and comfortable to use. Our rentals are competitively priced. Ensure the comfort of your staff or guests with our top-notch portable toilet rentals. If you have more questions about our services, get in touch with us. If your septic tank system has broken down, Stephenson Septic Tank Services can help. We provide septic installations, after we clear up or repair your old system. Stephenson Septic Tank Services is a trusted company that provides only the highest quality services performed by only the highest qualified technicians. When it comes to septic installations and cleanout, don't trust just anyone. 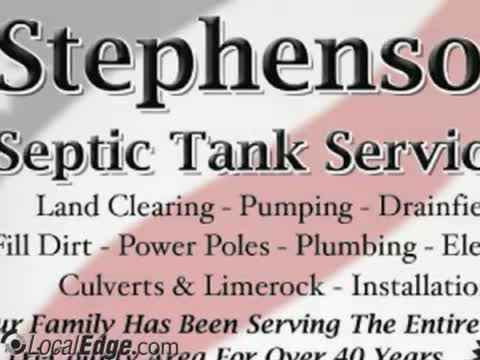 Turn to the professionals at Stephenson Septic Tank Service. For everything from tank inspections to pumping and repair, we can help. We also offer portable toilet rentals for your event!